Please post any issues/bugs regarding this app version in this thread. Congrats to the collaborative WeFold group for their recent paper published in Nature Scientific Reports. Thank you to all R@h volunteers who contributed to this work. Checkout a recent Bloomberg science opinion article about some of the science behind this project, protein engineering, and David Baker, titled Protein Engineering May Be the Future of Science. This version contains a bug fix for the cyclic peptide folding protocol. Please post any issues/bugs regarding this application in this thread. The Charity Team has chosen Rosetta@home for their 10th annual event to receive extended computation support for 2 weeks (January 14th 2018, 0.01h to January 27th 2018, 23.59h UTC). To participate, BOINC members are asked to leave their ‘Home Teams‘ and join the Charity Team to crunch Rosetta@home together without the normal ‘Race Conditions‘ during this time frame. Many thanks to the Charity Team for choosing Rosetta@home for their annual event! Congrats and thank you! 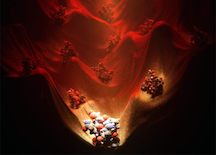 Chemical and Engineering News has highlighted our work for research of the year. Your contributions provided much of the computing to make this possible. Thank you! Rosetta@home has contributed to a number of recent publications. Congratulations and thank you! In Nature: building 20,000 new drug candidates. New de novo designed "mini-protein" binders were custom built to target either a deadly virus or a potent toxin and were shown to afford protection to mice. Read more. 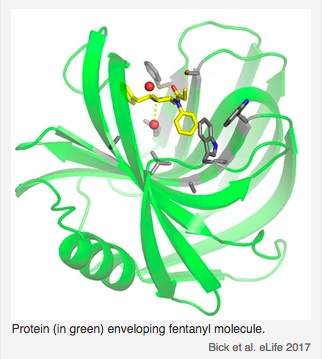 Sensors for the potent opioid fentanyl. Using a fully-automated Rosetta design pipeline, high-affinity fentanyl sensors capable of detecting environmental fentanyl were produced. Read more. In Science: data-driven protein design. This work achieves the long-standing goal of a tight feedback cycle between computation and experiment and has the potential to transform computational protein design into a data-driven science. Rather than observing thousands of complex natural proteins to try to deduce their folding rules, over 15,000 new, simpler proteins were built – all designed using Rosetta. Through multiple design rounds, features that led to successful folding were learned and incorporated into the design pipeline. Read more. 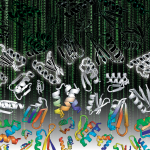 which is titled "Big data (and volunteers) help scientists solve hundreds of protein puzzles"
We recently published an article in Nature titled "Accurate de novo design of hyperstable constrained peptides". We would like to thank all Rosetta@Home participants for their help with this work. In the paper, we present computational methods for designing small stapled peptides with exceptional stabilities. These methods and designed peptides provide a platform for rational design of new peptide-based therapeutics. Constrained (stapled) peptides combine the stability of conventional small-molecule drugs with the selectivity and potency of antibody therapeutics. The ability to precisely design these peptides in custom shapes and sizes opens up possibilities for "on-demand" design of peptide-based therapeutics. We can now accurately design 18-47 amino acid peptides that incorporate multiple cross-links. We can now design peptides that incorporate unnatural amino acids. Specifically, we designed peptides with a mix of natural L-amino amino acids and D-amino acids (mirror images of L-amino acids). D-amino acids tend to provide better protease resistance and lower immunogenicity; both of which are desired properties in a therapeutic peptide. Unnatural amino acids also let us sample much more diverse shapes and functions. We can now design peptides that are cyclized via a peptide bond between their N- and C-terminus. Cyclic peptides provide increased resistance against exopeptidases as they have no free ends, and thus are ideal candidates for engineering peptide therapeutics. 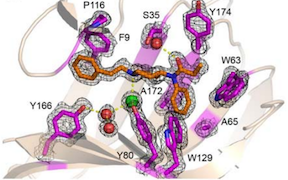 Structure prediction runs on Rosetta@Home for these designed peptide models played a key role in selection of good designs that were experimentally synthesized and characterized. Thank you all for your help in making this work possible! -- Gaurav B. 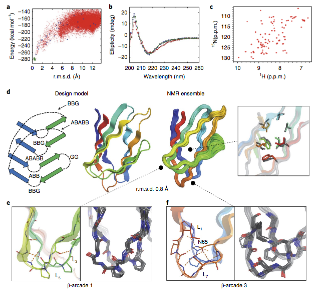 Nature paper "Accurate de novo design of hyperstable constrained peptides". Nature review "The coming of age of de novo protein design". In the last few weeks our project has experienced significant issues resulting in slower than usual work unit distribution, result processing, and credit granting. The cause of this was due to the increasingly large number of new hosts causing our database server to become very sluggish and eventually run out of disk space. Our short term solution was to reconfigure and optimize the project configuration and existing database server, purge old data quicker than usual, and temporarily stop resource intense database queries. This recovery mode will continue until the project stabilizes which may take a few days to a week. The long term solution will be a complete system hardware upgrade to all our servers. The BOINC server software will also be upgraded. We are in the process of ordering these machines and hope to have them running within the next few months. The project is somewhat stable now and clients should be getting work as usual. However, result processing and credit granting may still be slow and our status information/page may not be up to date as we are in recovery mode and our servers continue to catch up on things. Work history will also be shortened to temporarily save space. We expect things to be back to normal in a few days to a week. Sorry for any inconvenience and thank you for your continued contributions! We all collectively made the cover of the July 22nd Science-check it out! 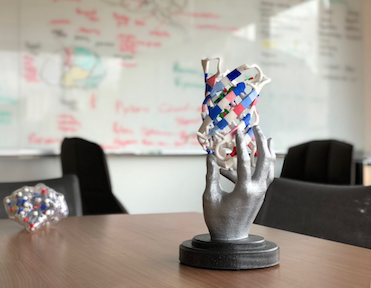 This same issue also has a news feature on our work, and an article on designed icosohedral cages made from two different designed protein building blocks. For more information and links to the papers, see Ratika's post in her thread. I recommend listening to graduate student Yang Hsia's podcast on designing protein footballs which you can find on the Nature web site this week to go along with his paper. (see Ratika's post for the link if you can't find it). Thank you all again for all of your contributions to our research-we couldn't do it without you! The minirosetta application has been updated to 3.71. This version includes an improved score function, new protocols, and slightly updated graphics. To report bugs, go to this thread. We are experiencing technical difficulties with our servers and are currently troubleshooting. We hope to have things back to normal soon. Sorry for any inconvenience. The minirosetta application has been updated to 3.54. To report bugs, go to this thread. 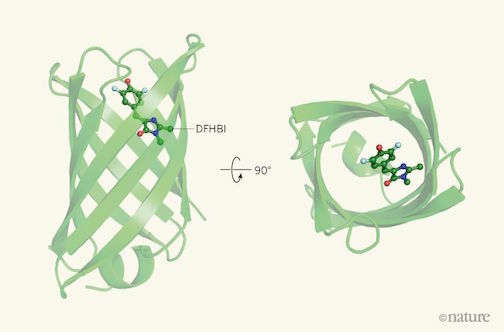 There has been very exciting recent progress in designing vaccines and small molecule binding proteins using Rosetta that is described in two recent papers in Nature. These and other recent advances are described in the new Rosetta@Home Research Updates thread. It was suggested there that we send out a monthly email newsletter describing recent progress--we haven't done this before to avoid clogging everybody's inboxes but we certainly could if there is interest. A number of users are having issues with our screensaver application automatically running in a pop-up window. We currently are not able to reproduce this on our test machines so we are asking users to please post any information that may help us track down this bug. Please post on this message board thread specific information about the boinc client version and platform version. We are also investigating another issue that may be related to an increase in our application database size. Your increased contributions to rosetta@home could not come at a better time! We've been testing our improved structure prediction methodology in a recently started challenge called CAMEO. For most of the targets, the Rosetta@home models are extremely good, but for a minority of targets the predictions are not good at all. We've now tracked down the source of these failures and it is what we are calling "workunit starvation"; in the limited amount of time the Rosetta server has to produce models (2-3 days) in these cases very few models were made-this happens because many targets are being run on the server so that only a fraction of your cpu power is focused on any one target. while we are working to fix this internally, by far the best solution is to have more total CPU throughput so each target gets more models. Rosetta@Home software updated to version 3.30. Addresses issues with Cartesian Relax and the modeling of disulfides in the hybrid protocol for comparative modeling. Last year we described in Science magazine the design of a new enzyme which catalyzes a chemical reaction called the Diels Alder reaction involving the formation of two carbon-carbon bonds. This reaction is interesting because no natural enzymes are known to catalyze the reaction. However, it wasn't a very good enzyme, and we asked FoldIt players to try to improve it. As described in Nature Biotechnology this month, remarkably FoldIt players were able to make the designed enzyme 20 times faster by inserting a completely new loop which helps the enzyme bind the chemicals it links together. The combination of Rosetta@Home and FoldIt is turning out to be powerful indeed for solving challenging problems in biomedicine! David Baker receives UW Medicine's Inventor of the Year award. Today's issue of Science magazine describes an exciting new approach to HIV vaccine design using Rosetta. In contrast with other viruses such as polio and influenza, inactivated HIV or HIV proteins have not worked as vaccines, and hence as you know there is currently no effective HIV vaccine. Our approach to vaccine design is to take the bits of the HIV surface protein that people make antibodies to, and using Rosetta graft them onto small stable scaffolds that can be made in large quantities and potentially could be useful as vaccines. We've shown earlier that this can be done straightforwardly with Rosetta if the bits of the HIV protein are contiguous along the sequence, but it is much harder if the antibody recognizes multiple bits close in three dimensions but far in sequence. In this paper we show how such "discontinuous" epitipes can be transferred from HIV gp120 to a simple scaffold protein. More work will be required to determine whether this or other vaccine candidates designed using this approach will be effective as HIV vaccines-let us all hope so!! A recent issue of Nature describes an exciting approach we are taking with collaborators to fight Malaria. The title of the paper is "A synthetic homing endonuclease-based gene drive system in the human malaria mosquito" and the PDF is available at my lab web site. The idea is to use enzymes which cut within critical genes in mosquitos to greatly reduce the number of malaria parasite infected mosquitos. There are still many issues that must be overcome for this strategy to be used against malaria in the real world, but this paper is an important first proof of concept of the strategy. This week's issue of Science magazine features an article on the use of Rosetta@Home to design novel proteins which bind tightly to the Spanish Flu (H1N1) Influenza Virus. The paper shows that the experimentally determined atomic structure of the complex between one of the designed proteins and the virus is precisely as in the computer model. The designed proteins block the function of the flu surface protein in biochemical tests, and we are guardedly optimistic that the designs will block flu infection. This is an important milestone for computational protein design (and for distributed computing)--the first atomic level accuracy design of a high affinity protein-protein interface, and the designed proteins are exciting leads for new flu therapeutics. In the next few months, we will be using Rosetta@Home to design proteins that bind tightly and hopefully block other pathogens which cause disease. Thanks to all Rosetta@home users for their invaluable contributions to this research!! Graduate student Shawn Yu is now posting on current Rosetta@home efforts to design inhibitors for viruses that cause disease in the "Design of Protein Interactions" thread on the Science message boards. Take a look if you are interested; he is happy to answer questions in the thread as well. Outage Notice: We are going to update our scheduler tomorrow, Thursday the 24th. The project will be offline intermittantly throughout the day. Outage Notice: We will be offline for a brief 1-2 hour period tomorrow, Thursday the 27th, starting at around 10am PST for maintenance. As many of you are probably aware of already, we've been working hard to try to resurrect the project with the resources we have at hand. Today we replaced a very small temporary disk with a larger 3TB one that we received from the vendor a few days ago. With this disk in place we should soon be back up and running. We have yet to restore data from jobs before the disk failure so these older jobs will still be pending. However, all pending jobs will eventually be granted credit. The good news is that the data from the failed disk has been recovered and we are currently copying it to the new disk. Thank you all for your patience. Today's heros are Keith and Darwin, our systems administrators and hardware architects. Yesterday, our main filesystem crashed hard. There were warning lights flashing behind every disk on the SAN and it looked pretty grim. Thankfully, Keith and Darwin were able to pinpoint the problem to two redundant laser modules for the fiber optic loops (it was amazing and unlucky that both failed). The laser modules have since been replaced and the filesystem is back up. We'll be starting up the project again shortly. Thanks for your patience. 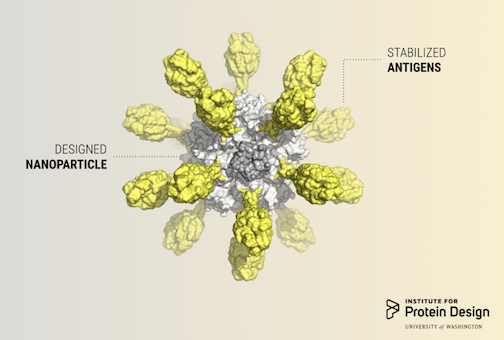 Read about recent work using Rosetta to design flu virus inhibitors, HIV vaccines, and HIV destroying nucleases in David Baker's journal and the Design of protein-protein interfaces thread. The minirosetta application has been updated to version 2.15. For details and to report bugs, go to this thread. The minirosetta application has been updated to version 2.03. For details and to report bugs, go to this thread. The minirosetta application has been updated to version 1.98. For details and to report bugs, go to this thread. Our filesystem became bogged down late last night. Thanks to Keith, our systems administrator, the project is back online. Based on the current rate of data crunching, the server lag problem should be alleviated through this weekend. The project is offline for the moment as we deal with an error in the recent application upate. Hopefully we will have the project back online within the next hour or so. Sorry for any inconvenience. A number of users are still getting signature verification errors with the database file so we've updated the minirosetta application to version 1.91 with a new database filename. 1.91 is a copy of 1.90 with the only difference being a new name for the database file to ensure that every host updates the signature. To report bugs, go to this thread. The project will be offline for a bit as we work on adding a couple web servers to the mix to help reduce the load on our servers. The minirosetta application has been updated to version 1.90. For details and to report bugs, go to this thread. Due to a massive slowing down of the lastest code, we reverted the application back to a version equivalent to 1.82, while we work on the code. Sorry about the outage. We've had a problem with the signatures on the 1.86 update. This issue should hopefully be resolved now with 1.87. Sorry about the outage. The minirosetta application has been updated to version 1.82. For details and to report bugs, go to this thread. The minirosetta application has been updated to version 1.80. For details and to report bugs, go to this thread. The minirosetta application has been updated to version 1.75. For details and to report bugs, go to this thread. The minirosetta application has been updated to version 1.71. For details and to report bugs, go to this thread. The minirosetta application has been updated to version 1.64. For details and to report bugs, go to this thread. Our project received a large donation from an anonymous donor and following the donor's suggestion, the University of Washington created a special Rosetta@home fund which makes it easy to make a tax deductible donation directly to our project. We've added a link to more information on our homepage in the "Join Rosetta@home" navigation section. Also, for more information see David Baker's recent journal post. Take a look at the recent work you've made possible with your contributions! D. Baker discusses the six (6!) manuscripts that the group is publishing, having used the computing power-house that is R@H, in the Rosetta@home Journal. Our database server lost power accidentally as work was being done on the rack. We are back up and running now. The minirosetta application has been updated to version 1.47. For details and to report bugs, go to this thread. Happy Xmas ! We are now recommending systems with at least 512MB of memory. The majority of tasks will run fine with 256MB but some tasks will involve larger proteins that will use more memory. The minirosetta application has been updated to version 1.45. For details and to report bugs, go to this thread. The boss, David Baker, won the Raymond & Beverly Sackler International Prize in Biophysics, thanks in no small part to your contribution via Rosetta@home. Read more at http://uwnews.org/uweek/article.aspx?id=45635. We're having increasing problems with our project's fileserver, causing intermittent outages. We're in the process of building out the replacement system but it is going to take some time to iron out the issues. We apologize for the troubles. We are currently participating to the first competition for modeling the structure of an important biological receptor. This protein is much larger than all the targets submitted so far and the calculation should last around 3 hours per model on a normal machine. The jobs start with 'AA2A.' If you have a short run time preference and you notice these jobs running past it, please do not abort them. The minirosetta application has been updated to version 1.25. This version contains a fix for a file formatting problem that was causing certain jobs running abinitio folding to fail. Please report bugs in this thread. The minirosetta application has been updated to version 1.15. This version introduces an improved method for modeling larger RNA molecules. For details, see this thread, and please report bugs in this thread. Rosetta has been updated to version 5.96. 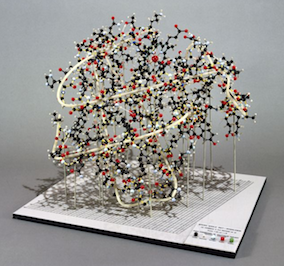 This version introduces an improved method for modeling larger RNA molecules. For details, see this thread. Minirosetta has been updated to version 1.09. New graphics for windows have been included, and graphics for the mac should be in by the next version. This update also includes a variety of new experimental protocols for fullatom minimization. Please post any issues/bugs in this thread. We're up and running again. A complete update of the scheduler and web site was made so please post any issues with the server and site in this thread. It looks like we've a left-over problem from the other day - we're working on this now.... .
Our web site has been updated with the latest BOINC version. Please post any bugs or issues in this thread. An article about Rosetta@home is in Nature. Congrats and thank you to all the volunteers that made this possible! Problems solved! Rosetta@home has been updated to version 5.80. This version contains support for having small molecules present in protein-protein docking simulations. This is used in the current round of Capri. For details, see this thread. Rosetta@home is currently down due to a technical problem. We are working on a solution. Rosetta@home has been updated to version 5.78. This version includes some small but useful updates for RNA folding simulations and some special symmetric folding runs as well. For details, see this thread. Rosetta@home experienced an unannounced, albeit planned, outage today at 8AM. For details see the technical news. Rosetta@home has been updated to version 5.73. This version fixes an issue in high resolution modeling of RNA. For details, see this thread. Update: R@H had been moved over to the fiber SAN.... more details here. Rosetta@home has been updated to version 5.72. This version includes some new features that will let us test variations of the energy function for proteins and RNA. For details, see this thread. Outage Notice: The project will be down tomorrow, Friday the 29th, from around 3pm to 5pm PST for maintenance. Rosetta@home has been updated to version 5.70. This version includes some new features in the RNA and symmetry modes. We are also testing the possibility of running some workunits with the old app (5.68) and another set of new workunits with the new app (5.70) to help us continue long-term studies and test new features simultaneously. For details, see this thread. A Japanese translation of Rosetta@home is now available. We'd like to thank Shinji Yamamoto for the translation. Rosetta@home has been updated to version 5.67. This version includes some extra features that will give us better control over the energy function for RNA workunits. For details, see this thread. We forgot to mention that version 5.64 also includes 64bit applications for windows and linux platforms. These rosetta applications are copies of the 32bit version. Outage Notice: The project will be down today for 2-3 hours at around 3pm PST for maintenance. Rosetta@home is now at version 5.54. This version fixes the RNA mode to follow your CPU run time preferences, rather than always producing 30 structures. There are also some small fixes in the graphics. For more details, see this post. Outage Notice: The project will be down today for 2 hours at around 3pm PST for maintenance. Rosetta@home has been updated to version 5.51 -- our first update after CAPRI. This version has a nifty new 'cartoon' look for graphics. We'll also be testing a new mode to predict structures of RNA, an older cousin of DNA, that folds into interesting unique structures. For more details, see this post. A promotional video about Rosetta@home has been posted on YouTube. Rosetta@home has been updated to version 5.48. We are including a special symmetric docking protocol and a fix to the problem of frequent watchdog terminations of docking workunits. For details, see this thread. Outage Notice: The project will be down intermittently today as we update the server to support new BOINC 5.8.8 client features. Outage Resolved: The project is back online. Our server that runs the validator and a couple assimilators went down last night. We've switched to another server but it may take some time to catch up and grant credit to pending completed work units. Outage Notice: Tomorrow at around 2pm PST, Friday, the project will be down for maintenance for 2-3 hours. Rosetta@home has been updated to version 5.45. The new version has some fixes in the graphics to make it significantly more stable and, as a result, sidechains and protein rotation has been turned back on. Some science related updates are also included. For details, see this thread. We will be updating the Rosetta@home application at around 6pm PST today. As with the last update, the application is available for download in advance. See this thread for more information. French translation is now available. We'd like to thank Arnaud and Thierry for making this possible. To select a language visit our language selection page. Rosetta@home has been updated to version 5.43. The new version has simplified the graphics in an effort to reduce graphics-related crashes for a small fraction of your users. Display of sidechains has been turned off temporarily as well as mouse rotation of the models. You can expect these features to return soon! For details, see this thread. We will be updating the Rosetta@home application in approximately 6 hours, 8pm PST. The new executable will automatically be downloaded to your client when you start a new workunit; you don't have to do anything! We've had requests from some system administrators to have an application available for download in advance; see this thread for more information. Rosetta@home volunteers are highlighted in a recent Howard Hughes Medical Institute article. Rosetta@home has been updated to version 5.41. The new version fixes some previously spotted bionc-related bugs and other science-related bugs which are important for proceeding with the CAPRI 11 prediction. For details, see this thread. Outage Notice: The project will be down for a couple hours starting at 3:00 PM PST today for maintenance. Rosetta@home has been updated to version 5.40. The update introduces a new type of simulation -- predicting the structure of amyloid fibrils ( details). Rosetta@home has been updated to version 5.34. The new version will allow us to test more accurate energy functions and to be more flexible with the bond lengths and angles in the protein; see this thread. Work unit deadlines will be extended to 10 days for new work unit batches. Our servers are back online and work is flowing now. New crediting system: We have officially switched to a new work based crediting system. See our technical news section for details. We are still working on the new credit system but it should be ready soon. Ralph@home is currently down for the moment as we move its hardware to another data center. It will be back online in a day or so. Thanks for your patience. Outage Notice: The project will be down for a few hours tomorrow starting at around 1pm PST to implement a new crediting system. Information about the new system is available in this Ralph@home thread. Maintenance is complete and we are back to normal operation. Polish and Russian translations of the Rosetta@home web site are now available. We greatly appreciate Bartek K ( Simek ) and the BOINC@Poland Team for the Polish translation, and Nikolay S for the Russian translation. To select a language, go to our language selection page. If your native language is not available, you can help translate our site. Outage Notice: The project will be down today for an hour or so at around 3pm PST for maintenance. A note from David Baker: We desperately need as much CPU power as possible for the next two weeks--there are more than 25 CASP targets due, including some that are our best shots at really high resolution models. Frustratingly, we won't be able to do anywhere near as much sampling as we had planned for these proteins as there are so many coming due near the same time, and thus can't really expect the accuracy we had hoped for. So if it is at all possible for you to increase your rosetta@home cpu time for the next two weeks please do--it will make a huge difference for our collective efforts! There are now German and Chinese translations of the Rosetta@home web site. We greatly appreciate the work from volunteers Arnaud, Christoph, and Yin who made this possible. If you would like to help translate Rosetta@home, instructions are available here. Our recommended memory requirement has been reduced to 256MB due to recent improvements in the memory footprint of our application. We updated our database and boinc servers today. Please report problems in this thread. The project is back online. Welcome to all of our new participants! I have only very sporadic internet access as I'm out of town this next week, but I look forward to interacting with all of you here when I return. I was absolutely delighted to see the large increases of the last few days; they will really help accomplish the goals of the project! Thanks again to all of you, David. The validator is cranking away now. We are having problems with our validator. It should be back online later today. We have made our first official submissions to CASP. Thanks to all who helped us predict structures for T0284 and T0287! We have changed the workunit buffer size from 65,000 workunits to 20,000 workunits. This is so that CASP7 targets experience a smaller lag time between being queued and being sent out. Outage Notice: The project will be down for an hour or so starting today at 3pm PST for maintenance. The rosetta@home assimilator will be turned off from 2:30pm to approximately 4pm for fileserver maintenance. Credit for results returned in that period will be granted but may be slightly delayed. We have shortened the deadline for workunits from two weeks to one week, to keep up with the tight CASP7 schedule. We will increase the deadline back to two weeks at the end of the summer, after CASP7. Rosetta@home has been updated to 5.16. In addition to matching the date, the new app has slightly lower memory requirements and includes some improvements that will allow us to test different science protocols. More info here. Rosetta@home updated to 5.13. New version fixes some debugging code that was causing slowdowns in a small fraction of clients. Application upgraded to 5.12. New version includes the ability to send out workunit descriptions and rescaled graphics for big proteins. For more information see this thread. University of Washington highlights Rosetta@home! Claimed credit for results with errors were granted with a maximum of 300 units. The rosetta application was updated to include some new scientific code. The application version numbers have been changed to be consistent with Ralph@home. Since error rates have decreased significantly, we decided to increase the default cpu run time to 4 hours. The previous default was 2 hours. Dramatic increase in success rate: A fix for the "leave in memory bug" in the BOINC API has reduced failure rate from 9.1% to 4.2% for Windows work units with the newest Rosetta@home release. Over 100,000 hosts have joined our project since June 2005. Thank you all for your participation! We are still actively seeking new members to help reach our target of 150 teraflops, so please spread the word out. Host Merging has been disabled for the time being... See Technical News for more details. Work is flowing again. We optimized database tables and backed up the database. Outage Notice: The project will be down for general maintenance starting today at 3pm PST for 1-2 hours. The default cpu run time is now set at 2 hours instead of 8. This change will affect new work units only. Rosetta application update! Graphics are now available for Mac OSX platforms. Outage Notice: The project will be down starting today at 3pm PST for maintenance. The server should be back online later in the evening. Work units will have a default cpu run time of 8 hours, and users will have the option to change the cpu run time as a project specific preference. The length of work units will no longer depend on the number of predicted structures. This option was added to allow participants to reduce bandwidth usage per work unit and maintain consistent run times. Users will also have the option to change the frame rate and cpu use for graphics. A new graphics version will be available for Mac OSX users. The validator has been fixed and work is flowing again. Outage Notice: The project will be down starting today at 8pm PST for maintenance. Our validator went down today and it remains unstable. We are going to try to fix it during the outage. The UW experienced a campus wide network outage today... See Technical News for details. 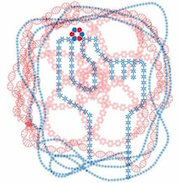 Protein Detectives, an article about David Baker and Rosetta@home, has been published recently in the HHMI Bulletin. Details about how we are applying Rosetta to help find cures for diseases such as HIV/AIDS, Cancer, Malaria, and Alzheimer's can be found in our new Disease Related Research section. Rosetta Graphics released for Windows. For details about the graphics, click here. See our new Technical News page for information about what was done during today's outage. Outage Notice: The project will be down again starting at 3pm PST for around 2 hours or less to improve the performance of our database server. Outage Notice: The project will be down starting today at 3pm PST for maintenance. We should be back online later in the day. Our database is being purged and old workunits and results are being archived. As a result, the load on the server is high and work flow has been reduced. See this thread for more information. We will be back up to speed in a day or so. 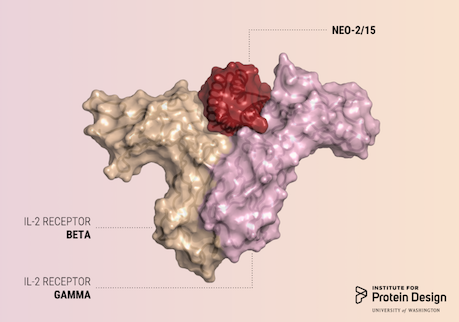 Rosetta designed protein, Top7, is Molecule of the Month in the Protein Data Bank. Version 5.2.2 of the BOINC client software has been released! See the BOINC website for details. News article about our research in the Daily Telegraph. David Baker's research in today's issue of Science. Science 16 September 2005: 1868-1871. NIH/NIGMS article about David Baker and his research. We have successfully switched over to a new production database server. The server is going to be down this Wednesday through Friday for maintenance. Over 14000 ab initio and 2800 full-atom relaxed structures made with constraints. Top full-atom relaxed model so far has an RMS of 0.54 to native. Best scoring model has an RMS of 0.70. Mac OS X version added. Over 6000 structures made. So far the top model has an RMS of 2.31 to native. Rosetta for Windows and Linux platforms available. Initial work units are 2ptl ab initio folding tests.